I thought only my kids wanted to read the same story over and over again, even though we have tons of books at home. I was seriously considering help, because I just couldn’t bring myself to open up the same book, wait for the same questions on the same pages and relive the same bedtime story routine night after night. But then I found out, I am not alone and there are Moms who feel the same. The awesome Nicole from Nicole Leigh Shaw Tyop Aretist gave bloggers the unique opportunity, Character Assassination Carousel, to vent out their frustration and destroy a story character. After the n-th reading the whole bunch from the Hundred Acre Wood make me feel like relatives you are excited to see on a Christmas dinner but can’t wait to get rid off before New Year’s; Pooh is plain silly, Piglet is just too nice, Owl sounds dull and Eeyore makes me gloomy as well. There, I’ve said it. 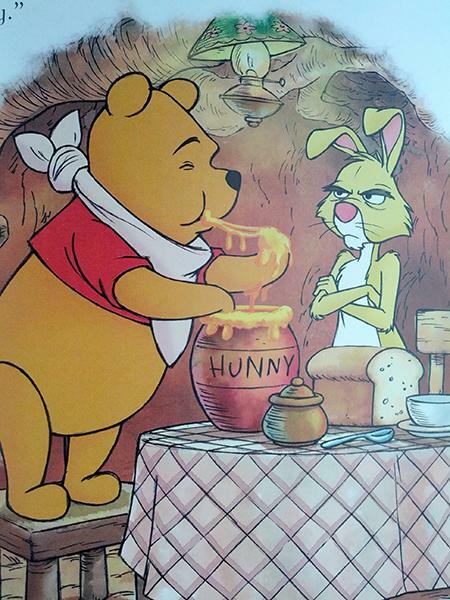 More specifically I don’t get why Pooh has to talk about nothing but honey. I get you like to eat it. Fine, but because of the bear I crave honey, too and always end up eating it more than I am supposed to, while my kids couldn’t care less. Even if I mention Pooh at breakfast seems to do no good. They just don’t want to try it, because apparently bears and Moms eat honey not kids. Thanks, Pooh. But when Pooh admits all the veggies Rabbit has grown in his garden aren’t as good as his beloved honey, that’s suddenly all the proof they need to steer clear of it as well, since even the bear, who loves honey, doesn’t like it. But again nobody wants to eat honey. Oh, great, thanks, Pooh. And don’t get me started with the Rabbit and his little gardening project. We live in a building and nothing grows in our apartment, because I have only a talent for viscously murdering plants, by sheer neglect or too much care. Every time, he shows up with his scissors and a shovel I get questions on why we don’t do that as well. Luckily none of the little buddies have kittens or dogs, or I just might be stuck writing this with a cute mutt chewing on my ankles. While Rabbit, makes me incompetent in the field of gardening, perfect Kanga makes me feel inadequate everywhere else. The perfect Mom Kanga, who apparently does everything with poise and grace, has warm hugs to offer and a quiet demeanor I could never muster, she cooks, cleans, keeps order and is the perfect Domestic Goddess. All while raising the kid on her own, while I can’t keep it together just for the evening routine. Still if I had a perfect little kid like Roo, and yes, I am complaining about my kids, otherwise I probably wouldn’t even be writing this so vigorously, I probably could pull it off. 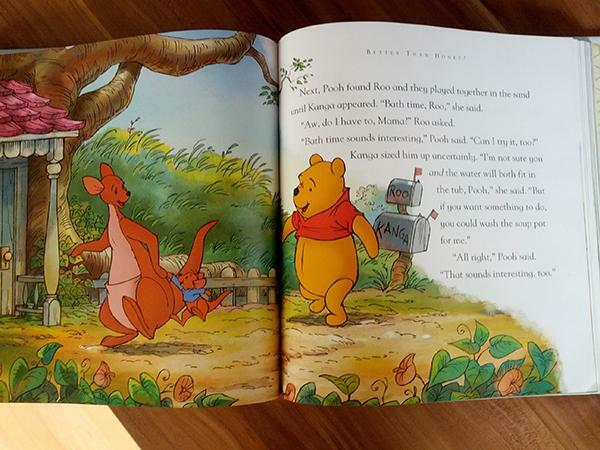 I bet Roo picks a different book every night or perhaps Kanga is just made of sterner stuff. Though I can tell, things in the Kanga and Roo’s houshold are not as great as we are led to believe. Because I see Roo complaining about taking a bath. Just like any kid, right. Just like my kids and the fact that Roo doesn’t seem eager to do it only grants them extra arguing points, when it comes to them taking a shower. And it already takes a whole lot of convincing, bribery or sinking so low to the point of using “because I said so” just to get them clean. I bet Kanga never does that. So while this family makes me agitated, I always end up feeling sorry for the little Piglet and am silently rooting for him to leave and find other friends. Like the ones who’d pick him over the honey. They are all truly a bunch of weird characters and that Christopher Robin must have a wicked mind to come up with them. Makes me wonder what my kids play with their toys and what kind of stories they create. But I bet none of their stuffed animals is as obnoxious as the Owl. Must it use words that make me lose ten minutes to explain. What is a memoir? Yeah, try clarifying that to a three year old. Baby, it’s a story of your life! Hm, what? You were born, we read Winnie the Pooh a gazillion times and now here we are. And did they really need to make Owl so patronizing? At times I feel as I am listening to myself. And what’s with Eeyore. What’s the reason for him being so forlorn? I feel as I am missing on the prequel, to understand the issues that brought him to here and now. Perhaps there was a Greek like tragedy in his personal life and it’s perfectly reasonable he’s still depressed. Or perhaps he’s just been hanging too long with the Hundred Acre Wood gang and can’t see the point any longer. I feel for you. That’s why reading his part of the story is my favorite, the two of us are so alike. With every word of the tale it’s as if all the light was being sucked out of me. So, he’s actually the character it’s easiest for me to do, though that particular talent is wasted on my kids. Finally, let’s bring the Tigger down and finish this up. Fortunately they didn’t make him as depressed as Eeyore or there’d be no Winnie the Pooh anymore. But OK, I get it those are his friends, it wouldn’t do to eat them up, but what exactly does he eat? Perhaps we don’t want to know that, as long as it’s not Piglet. And why if he has four functional legs, doesn’t he use them? He’s stuck on the tail as Pooh is on honey. (Both very unhealthy obsessions.) The more he bounces the more we have to bounce and than I am the bad one when I call a stop to it, yeah, thanks a bunch Tigger. Can I send you the bill for the new bed? And by the way, how is that supposed to get them in the mood for sleep. It only gets them in the mood for another story. 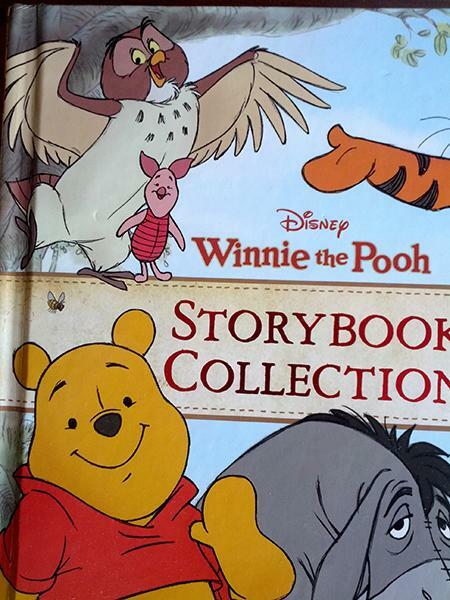 Still I am convinced there are worse books out there, Ive seen them, I’ve had to read them, luckily only a few times, so perhaps I shouldn’t complain about being stuck with Pooh, which just reminds me, I’ve got to go and eat some more honey. Pooh tales might be the most mind-numbingly boring tales of all. And honey isn’t half as sweet as the moralizing! Thanks for playing along! So glad to have you on the CAC.